Spring has sprung! And, if April’s showers didn’t bring you May flowers, don’t worry! There is still time to enhance your yard with a garden full of color and fragrance. Below are six simple steps for starting your own garden. First, you will need to pick the right location for your garden. When scouting locations, take into consideration the amount of sun exposure and the accessibility to water. You will also want to look for places that have healthy soil. To figure out what type of soil you are working with, you can take your soil to a local Cooperative Extension office or a local nursery to get tested. This will help you determine what plants will do best in your garden. Next, you will want to clear the planting area. Remove any sod, weeds or other debris that may be in the area. Then spread a 4-inch layer of compost or fertilizer. Using a spade fork, work the soil so that it is well mixed, soft and has decent depth. Where to even begin! Selecting plants can easily become overwhelming simply because there are just so many options. Do you want annual flowers or perennials? Peonies or roses? Should you get drought-friendly plants? The options are endless. The key things to keep in mind are your soil type, and how much time and effort you are planning to put into tending your garden. If this is your first time planting a garden, we would recommend choosing low maintenance perennials, such as sage, daylilies or catmint. Remember, this is the fun part! So pick a variety of different colored plants and flowers that will help liven up your landscape. When it comes time to plant your garden, follow the guidelines on the seed packet or plant tag as closely as possible. Dig each plant’s hole twice as wide as the original pot. This will give the plant’s roots plenty of room to grow and ensure that the plants aren’t crowding each other. Also, make sure that the hole is deep enough that the plants crowns (where the plant meets the soil) are level with the existing soil. If the crown is above the soil, the plant may dry out. Or if it’s too deep, it may become over saturated with water. The most important aspect of sustaining a garden is consistent care. Some plants are more demanding than others, but there is always upkeep to be done, whether it be planting, staking, watering, cutting back or weeding. 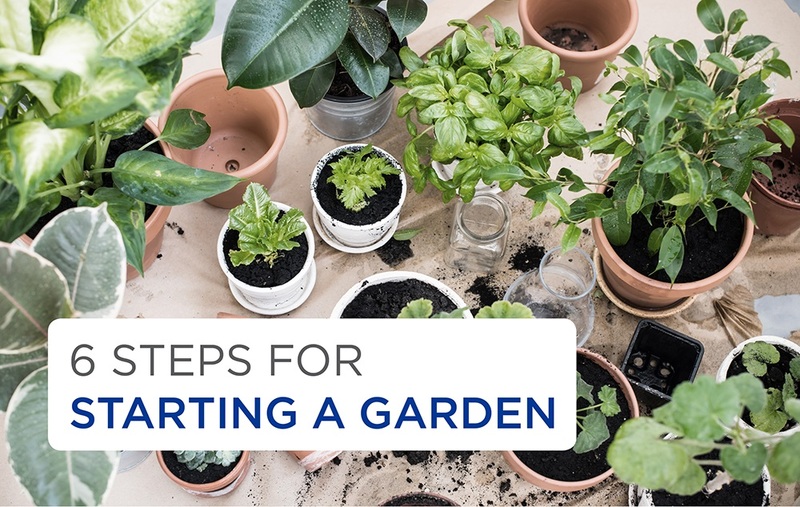 Regular tending of your garden will allow you to see what plants do best in your garden, identify the ones that you don’t care for and help you prepare for future gardening adventures.